Before Digg released the Diggbar a few days ago, many users may never have bothered to visit the comments page or upmod a story. It was just too much work to upmod a story, specially when the Digg Redirect script took us directly from Google Reader to the story. With the digg bar, it becomes a lot easier for users participate. I think that the Digg Bar is a great idea and wantedto replicate it for reddit too. 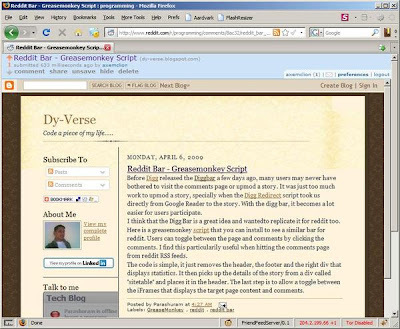 Here is a greasemonkey script that you can install to see a similar bar for reddit. Users can toggle between the page and comments by clicking the comments. I find this particularily useful when hitting the comments page from reddit RSS feeds. The code is simple, it just removes the header, the footer and the right div that displays statistics. It then picks up the details of the story from a div called "sitetable" and places it in the header. The last step is to allow a toggle between the iFrames that displays the target page content and comments.